Delightful Aurelian lily blossom, juicy orange and cassis, surrounded by jasmine, rose and lavender on a creamy background of coconut, apricot nectar and musk. 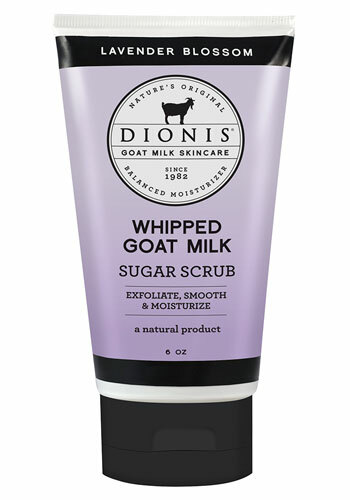 This gentle, yet hardworking whipped sugar scrub removes dry, flaky skin cells and brightens tired, dull looking skin to promote smooth, healthy and flawless skin because it contains Goat milk and Chamomile. Goat milk contains alpha-hydroxy acids ideal for exfoliation; plus it's enriched with high amounts of protein, fat, iron, Vitamin A, B6, B12, C, D, E and many more. These vitamins and minerals help the skin rebuild, add elasticity, and help retain skin moisture making this whipped sugar scrub ideal for delicate and sensitive skin. Directions: Apply a generous amount of sugar scrub to clean, wet skin. Massage gently in a circular motion focusing on rough areas. Rinse thoroughly and pat dry.